Stuffed Acorn Squash, Thyme for Cooking gourmet menus. 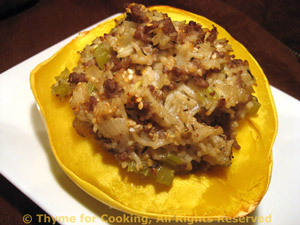 This is my 'other' stuffed squash recipe. I originally did it in a butternut squash, but preferred the acorn. This was a white, rather than the traditional green, acorn squash.